Grade of "C" or better is required for each course in the major. All courses in the major must be graded. Pass/Fail is not accepted. 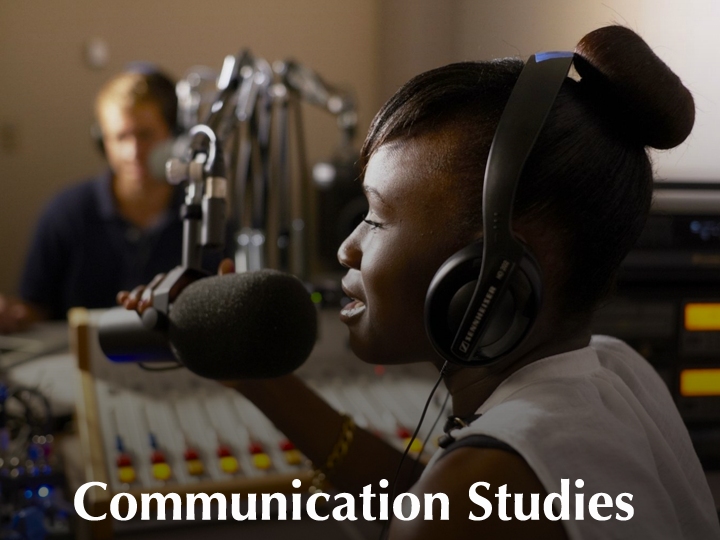 The Bachelor of Arts in Communication Studies is a problem-focused program that emphasizes contemporary cultural concerns while situating these within the broader context of communication and cultural theory. The purpose of the degree is to provide students with the awareness, knowledge, motivation and skills to develop communication strategies to address the problems of a global society, and the emphasis is on all forms of civic engagement. The program examines the strategic role that symbol systems play in constructing meaning in a fast-changing, information-based, media-saturated, and culturally diverse world. Courses examine how meaning informs and persuades individuals, and introduce students to the history and theories of how communication operates in societies. The goal is for students to demonstrate a high level of oral and written communication, critical thinking, and analytical problem-solving skills, and to become active in civic life. Download the Academic Learning Compact for Communication Studies.